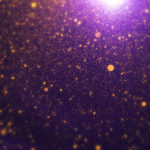 Digital Anarchy’s newest video plugin Transcriptive is finally out. 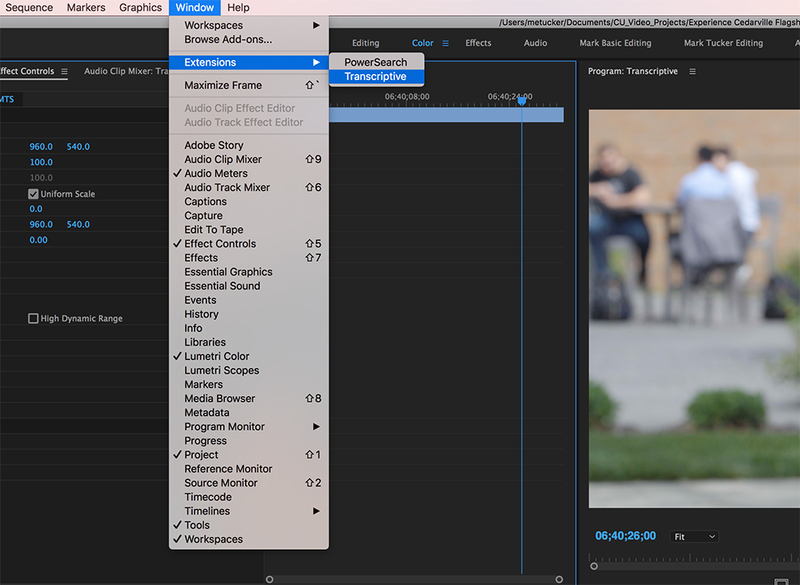 This new powerful video plugin for Adobe Premiere and Adobe After Effects takes does in minutes, what it would take a team of workers to do in days. Full automated using Speechmatics or IBM Watson, this new plugin has been released by Digital Anarchy and is powerful. I have bought it and use for all my transcription work and it has saved me hours of time. What this plugin does export the audio from any sequence or timeline and sends it to one of those two transcription engines, Speechmatics or IBM Watson. Within a few minutes, you receive an email saying that this transcription has finished followed by a complete layout of time codes with their individual blocks of text. I have detailed a brief walk-through of the plugin and how it works. Once you purchase the plugin, double click the installation and follow the instructions. The install takes only a few moments. Once you have installed it, I use it in Adobe Premiere, so in order to locate the plugin, go to Window, Extensions, Transcriptive. 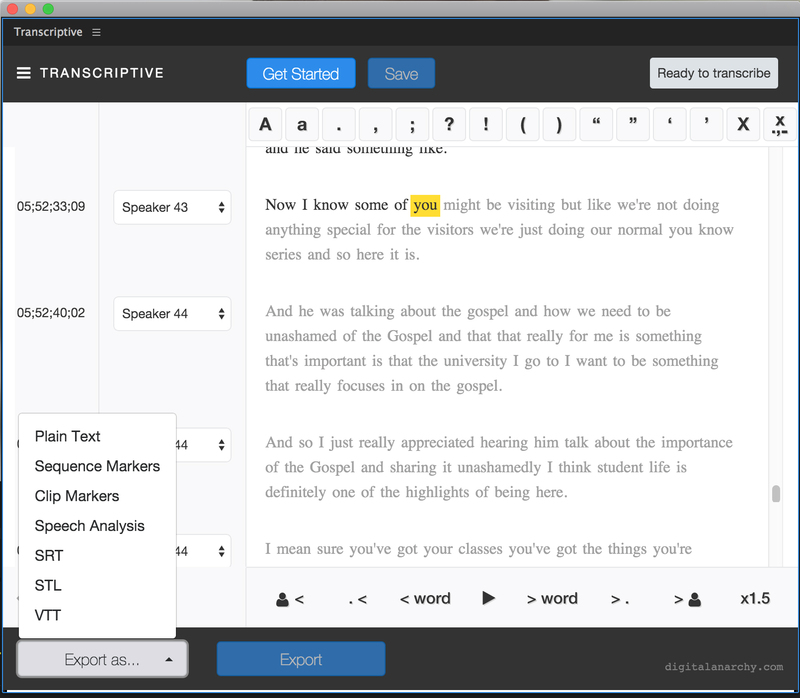 Next, it opens a new window and you will need to select your transcriber engine. 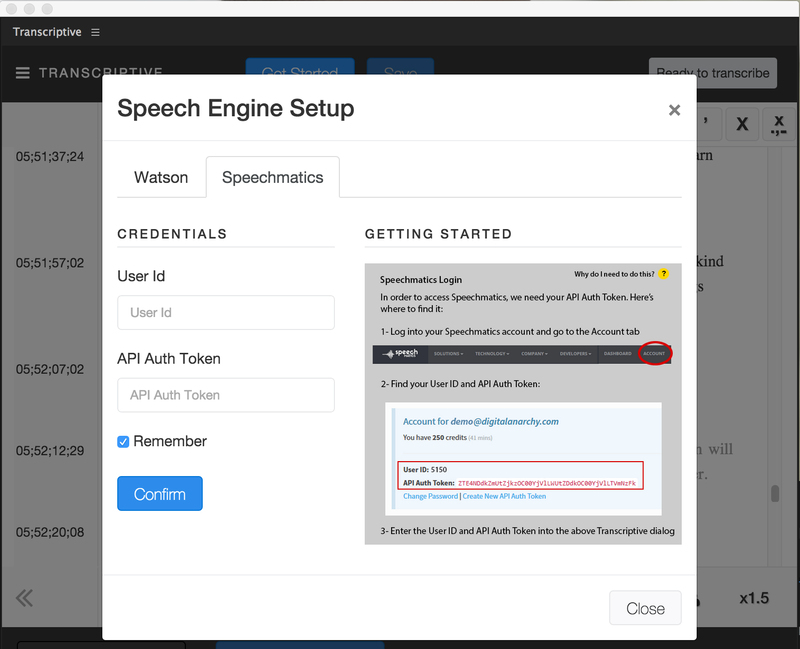 Speechmatics or IBM Watson. Setting up accounts with either is simple. I went with Speechmatics and their accuracy is well within 94%. I have had very few words need to be edited. Enter your user ID and API Auth Token which can be found in the settings of Speechmatics, which is the service provider I recommend. Though their rates may change, you can purchase credits with Speechmatics for very reasonable prices. 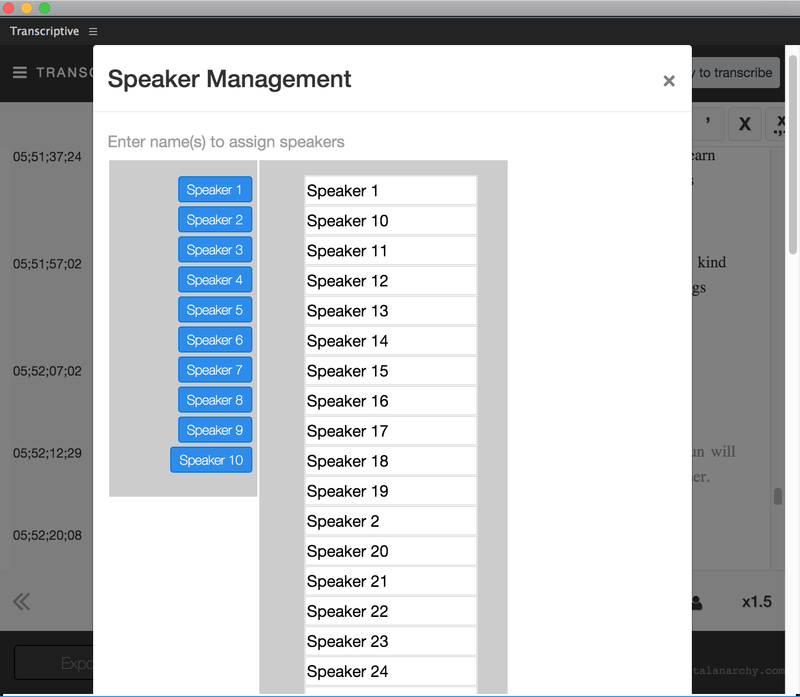 Next you will want to set up your Speaker Management. In this window, every time you have a different clip in your timeline, you can select it as a different speaker. So if you are doing a two person interview, you can select Speaker 1 and give it a name, as well as Speaker 2 and give them a name. Before transcribing, be sure to copying all the other footage you don’t want transcribed to another timeline. If you don’t you will be charged as the program will transcribe entire sequences. Next, you are ready to transcribe. Once you hit Transcribe, it takes a few moments for it to do its magic. The amount of footage you want transcribed will determine how long it takes for you to get the results back. It works very quickly though. I have 7.5 hours of interviews transcribed in less than 2o minutes. That alone would have taken 3 people two weeks to transcribe. Once the transcribing it finished you will see in the window all the text with the time codes and speakers. 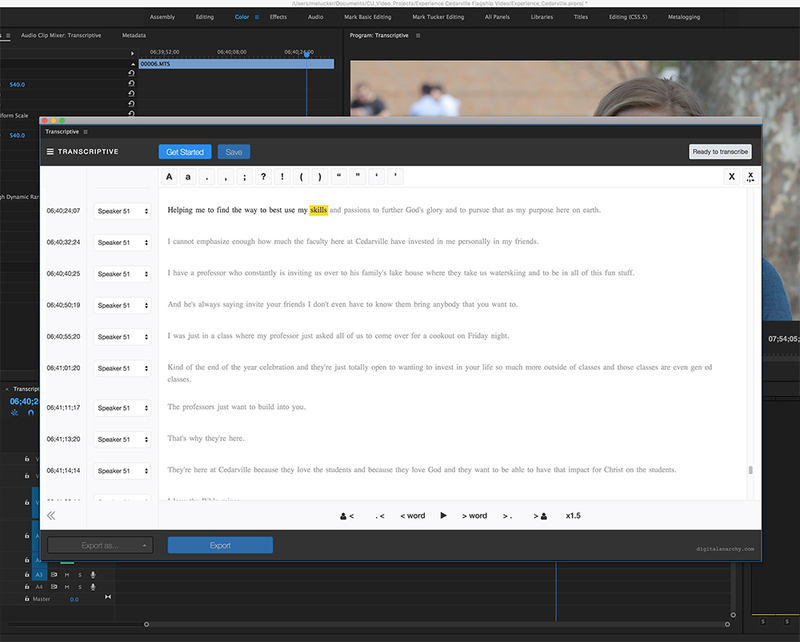 One neat feature is that as you click on a word in your transcription, the video playhead moves to the clip where that word is spoken, making it very simple to find the parts of the clips you want to use. One of the other neat things about this plugin is the ability to export this data to a text document, or as another format within Premiere. With a variety of export options, it makes it very simple to move this valuable data and send it anywhere it needs to be. I have barely scratched the surface of what this plugin is all about and the other neat things it can do. If you want to learn more about it or purchase it, visit Digital Anarchy. They hare excellent tech support and when I called to ask a few questions, I got a real person to talk with who was very knowledgeable about the product. 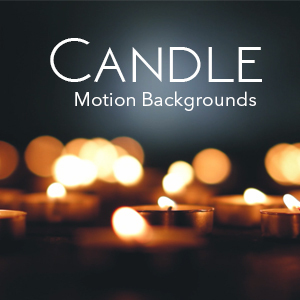 This video plugin has saved me weeks worth of time and money and am very thankful that it is now a regular part of my workflow. Below if a short video of Digital Anarchy at NAB2017. Digital Anarchy Transcriptive – Newsshooter at NAB 2017 from Newsshooter on Vimeo.